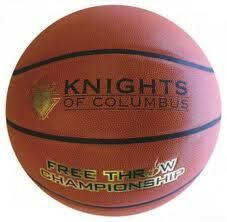 David Peters, council Free Throw Competition Chairman announced today that he has scheduled the Knights of Columbus Free Throw Contest at St. Thomas More Church for Saturday, February 11th at 9:00 a.m. It will be held in the School Gym. This is open to not only St. Thomas More School students, but all students within the area. This program was started by the Knights of Columbus in 1972 and has served our youth for forty years. Many parents were themselves in the contest early in their life. The contest is open to all boys and girls ages 10 to 14. To view a short video of Bishop Barres discussing the virtues of both the Free Throw Championship and the Soccer Challenge, click here. For member knights, we ask that you share this information with your friends and family. The more students that participate makes for a more exciting event for all. Winners in each age group go on to district and state competition. Volunteers are needed to help with score-keeping and running the event in general. David states that he could use up to 10 helpers. If people could please contact David for more details or to volunteer, email David.